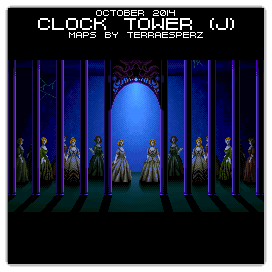 For this month's "Maps Of The Month" featurette, I wish to draw your attention to TerraEsperZ's Clock Tower (J) (Super NES) maps. The Barrows Mansion is definitely a creepy place, and somewhat large. With a number of doors and some similar-looking hallways it can be easy to get lost. What makes it interesting - but potentially more confusing - is that some rooms may be swapped around with each playthrough. TerraEsperZ has done a great job at laying it all out, so when the Scissorman attacks, your chance of survival is better. Or at the very least, you can plan efficient routes to end the nightmare as soon as possible. Thanks, TerraEsperZ! Interestingly, despite being among the most honoured mapmakers on VGMaps, this map is TerraEsperZ's first (and currently only) submission for the Super NES atlas. So to recognize the courage in surveying (and surviving) the Barrows Mansion, TerraEsperZ's Clock Tower (J) (Super NES) maps will be known as VGMaps.com's Maps Of The Month for October 2014. Thanks a lot for this honour! Let me begin by saying that this game was quite a challenge to map! First of all, the Barrows Mansion is relatively big and quite three-dimensional, not to mention a bit Escheresque with regards to the West Wing and the hallway doors essentially being on the wrong wall. It was a challenge for me to decide how to assemble everything, where the connecting lines would go and how the whole thing had to be easily readable while not being too cluttered. I think I did okay but if I'd had a more powerful computer, I think I would have placed the rooms farther apart and the connections between rooms more visible. Second of all, this game features a certain amount of randomness in several respects and it hasn't been that well documented. The various FAQs and walkthroughs online were rarely complete or that comprehensive and it was long and difficult to play the game enough time to encounter every possible outcome. As a result, I wasn't able to accomplish all of my goals with this game, namely to make separate versions of the map featuring first all the possible "danger" and "safety" spots, and another one featuring a comprehensive walkthroughs of the game detailing all the puzzles and their variations as well as all the ways you can influence which ending you achieve. Sadly, that would have necessitated far more work and formatting than I was capable of to make the whole thing work as a visual guide to the game. I'm still happy with the final result, but I can't say I'm not disappointed that I wasn't able to achieve all I set out to do. Forever the perfectionist, it's not surprising to hear you say that you know of ways it can be even better - and you are always welcome to update it if you do ever decide or are able to do so...but I can say that as a visual guide, as it is, it has already been helpful. I can personally attest to this. Anyway, I probably wouldn't have really made time to play this game in the first place if not for the map, let alone getting through it, with the best ending to boot, so if anything, it has at least been of benefit to me. Thanks!